We currently utilize a high-end professional grade Fluke TiX520 infrared thermal imaging camera. Wide angle and telephoto lenses quickly field swap-able when needed, plus up to 4x digital zoom with every lens. Minimum focal distance at approximately 6 inches. Handheld portable with 240° articulating lens and a 5.7 inch responsive touchscreen High Resolution LCD display, and 60 Hz refresh rate (smooth image display). State of the art post-image processing and data analysis with multiple color palette choices. On-screen (field adjustable) emissivity, reflected background temperature, and transmission correction. There isn't a single thermal imaging camera on the market that adequately serves all potential infrared applications. Some applications such as industrial furnace inspections and vapor or gas leak detection require specialized infrared equipment. 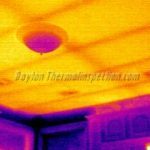 Regardless, many professional grade thermal cameras can accommodate a wider variety of common and specific applications. 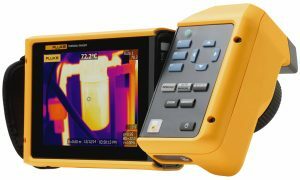 As the technology improves, manufacturers are able to offer many more choices of thermal imaging equipment than was previously available to suit a variety of uses. Choosing the correct equipment for the job at hand requires education and understanding of equipment specifications for the intended application. This is especially important in the fields of commercial and residential systems or building inspections. Professional equipment and training requires a significant monetary and time investment. The image depicts the difference in image quality as well as accuracy in documenting a known concern. These were captured under less than ideal conditions with merely a 7 degree temperature difference at the surface. The bottom right shows the visible light (digital) image where clearly a stain is visible. The top two images are from the consumer-grade C2 which are unclear and entirely fail to document active moisture in the stain. The bottom left is from the equipment utilized by BC Warner Inspections. It clearly indicates (through the dark amorphous spots in the center) that the stains are indeed active. Now admittedly, a thermal camera was not necessary to determine whether the stain was active or not. Any good inspector would have used a moisture meter to determine the same. But, the images clearly illustrate that low-quality equipment can miss concerns... especially if they aren't visible to the naked eye first. Worse yet, a poorly equipped inspector with little if any training or experience may inaccurately claim a problem exists when it doesn't. 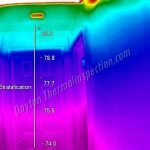 Infrared inspections for commercial or residential applications are some of the most complicated applications known to the infrared industry. 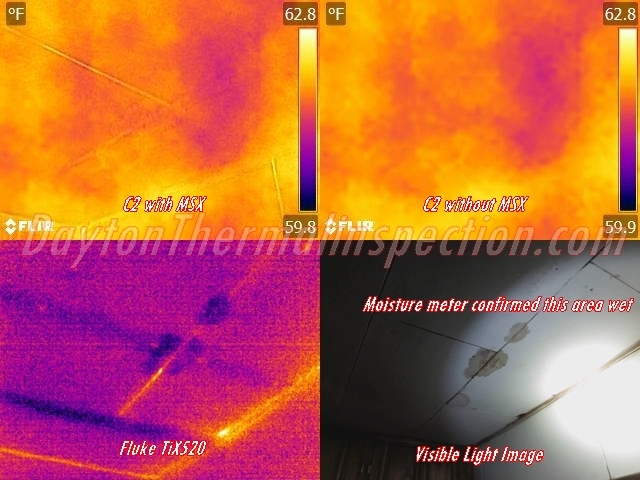 These applications combine the knowledge of a building inspector with the advanced science behind infrared technology. Not fully understanding either is a disastrous combination for both the client and the inspector, but the client is the one who has the most to lose. 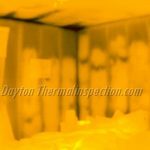 When accuracy, quality, and experience matters, BC Warner Inspections & Thermal Imaging Services is the right choice for your inspection application.